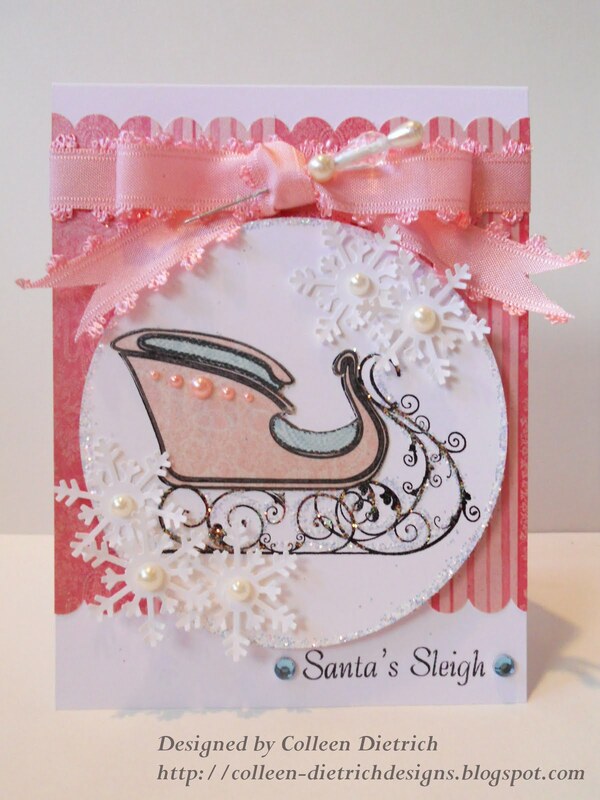 Santa in a pink sleigh? I think Mrs. Claus may like it better with all the pearls, bling and snowflakes. 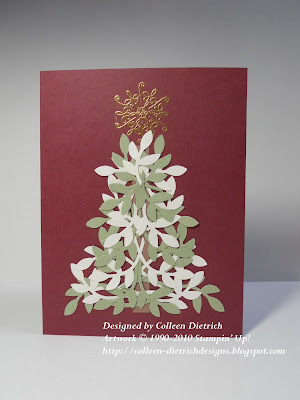 I sure had fun making a Christmas card in non-holiday colors. I used the paper-piecing technique to do the sleigh, using some of my beloved Luxury Stack designer paper from DCWV. I hoard that stuff. The background stripes behind the sleigh layer are also from that stack. Sure, there was plenty of light, but it's very shadowy and washed out. I prefer the top photo, which was taken on my kitchen floor, near a window with morning sun coming in, and the overhead kitchen lights turned on. Those overhead lights helped cast away some shadows. 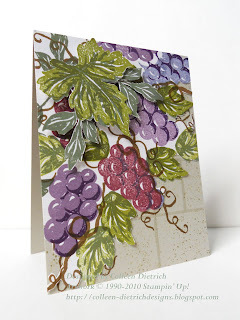 I like grapevine motifs. My bathroom and kitchen both have wallpaper borders with grapes on them. 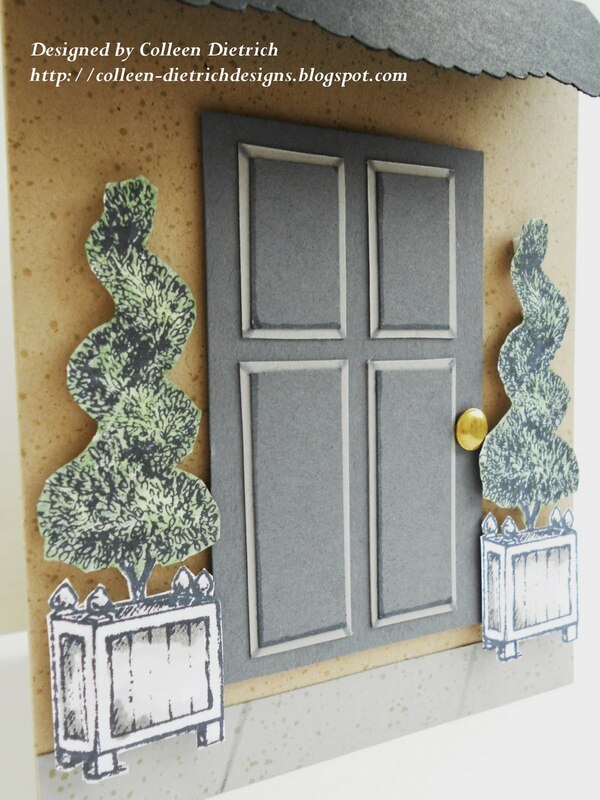 They were my inspiration for this card. 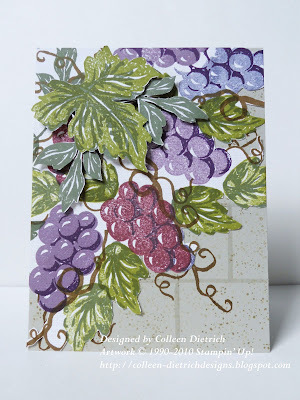 I created a 'wall' behind the grapes using Sahara Sand paper, sprinkled with a background stamp from Itty Bitty Backgrounds, then used a Versamarker to create 'bricks'. My 12 YO doesn't like the white peeking out behind the grapes. 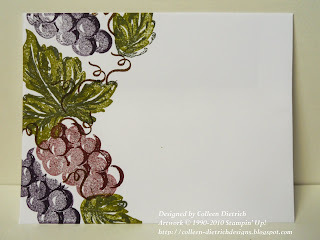 I did not want to stamp on Sahara Sand because it would affect the colors of the ink I chose. I also tried using masking to help me layer images upon one another but I learned a lesson. 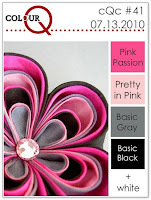 Do NOT create your mask out of cardstock. It is too thick, sits up too high above your images, and won't let all the ink down to the paper where you want it to go. Usually I use a sticky note. Guess that's what I'll need next time, too. The leaves in top left corner are popped up on dimensionals. 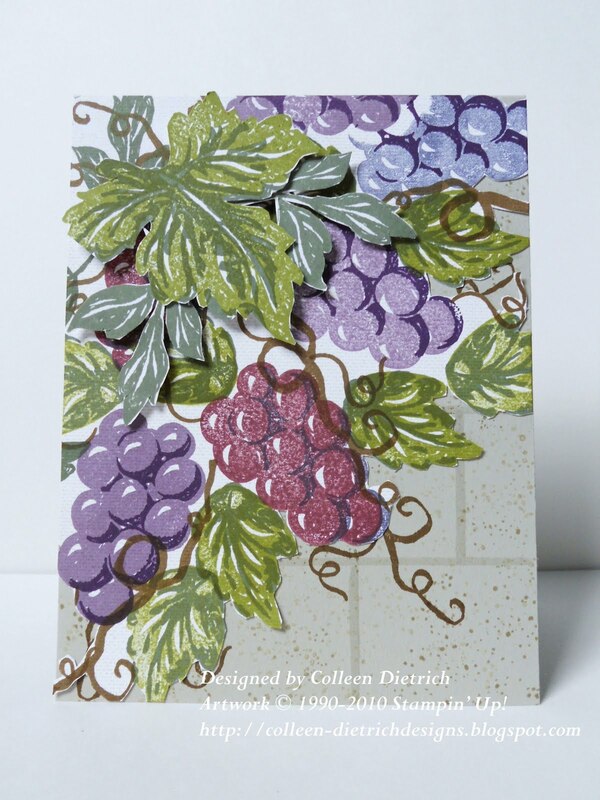 These grapes remind me of my husband's homemade wine. Don't let those words scare you! It is truly awesome stuff, using bonafide equipment from a home brew place. He makes Pinot Grigio, Chardonnay, Merlot, and I can't remember what else. It's ALL good! So goes the title of a famous Dr. Seuss book, which resides still on our bookshelf. 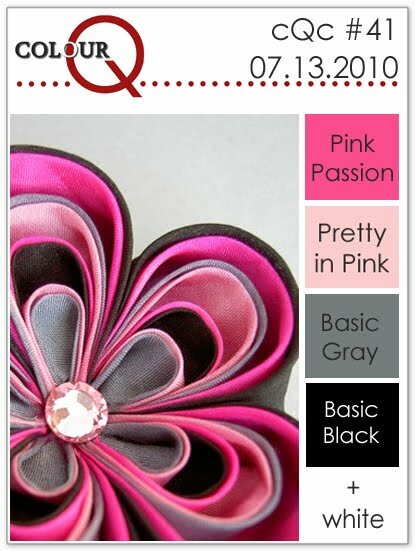 It is also the name of a challenge over at Splitcoaststampers. I took it literally and used fish AND red and blue. I'm lovin' my Bizarro fish stamp. 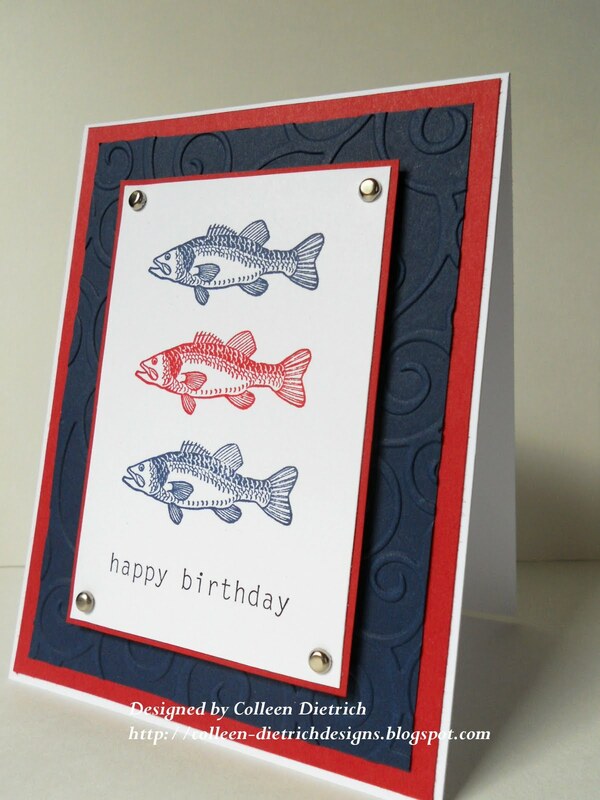 Did you see my Fishy Father's Day card? The stamp sat for 20 or so years in a drawer, and now it's seen ink on two cards within a couple of months of each other! It definitely says "masculine" to me, and so this card fits another challenge over at Mark's Finest Papers. I'm not usually into things with patriotic colors (that has no effect whatsoever on my patriotism though). But I kinda like how this turned out. 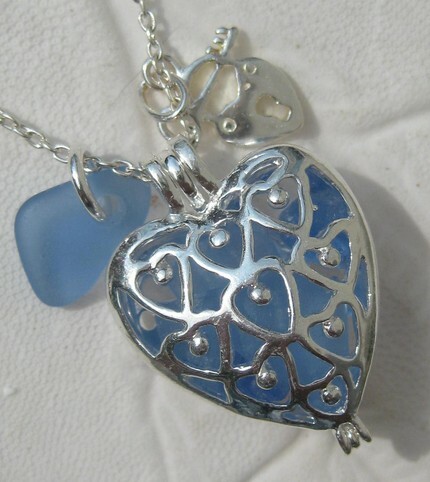 See the embossed 'ocean waves'? 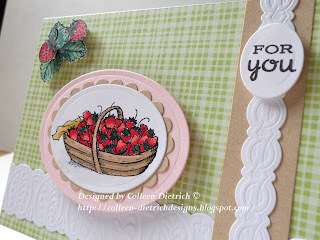 My Late Summer Wreath card was mentioned today on the ColourQ Challenge blog by Arielle - Snappy Stamper. I did not make it into the top Court, but hey, an honorable mention is just fine with me! 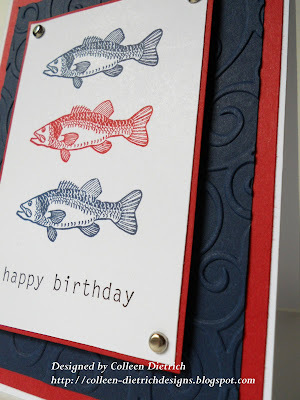 Stamps: fish by Bizarro, Birthday Whimsy by Stampin' Up! Boy, I have been a stamping fiend these past few days! When my mom was visiting, it was hard to find the time, but I have allowed myself free reign to stamp-stamp-stamp this week! Tomorrow I am going to the beach with my girls, so there won't be time for crafting. I've never played in the Color Throwdown Challenges before, so this is my first time. Well, for that matter, I have never entered the other two sites' challenges before either! I do not own Marina Mist yet, so I subbed a paper from Die Cuts With A View. 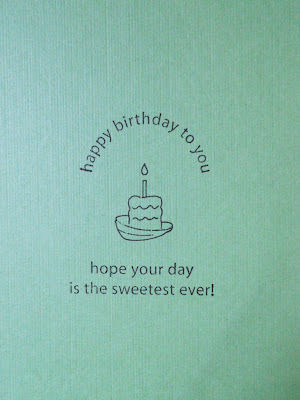 Since this is a birthday card, it fits into two other challenges as well. 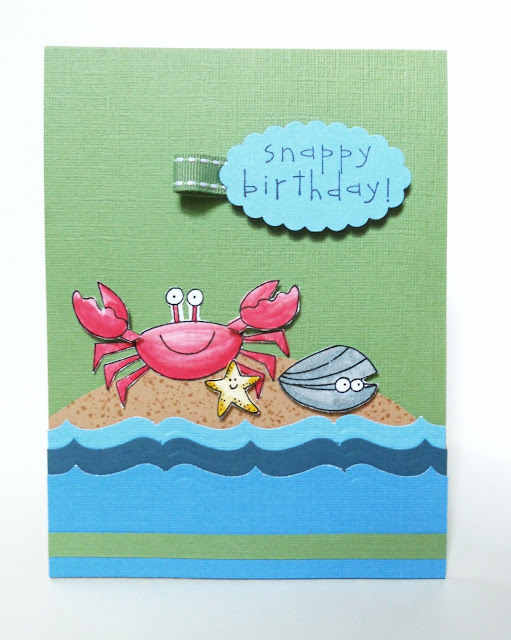 My 'crabby' card started out as a completely different card, in my mind. I mean, there's no resemblance whatsoever to what I had pictured. Ah well. Sometimes the card takes you for a ride, instead of the other way around. I still had fun, anyway! Okay, this goes to show you that inspiration for a card can truly be found anywhere! 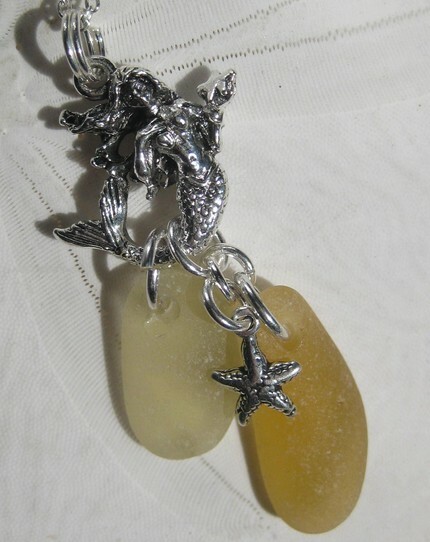 I chose the colors based on the EtsyInspired Challenge #97, "Mermaid's Tears Jewelry", a fabulous jewelry website using only real sea glass, which you can find here. Such soft, pastel shades on these pieces. Sigh. 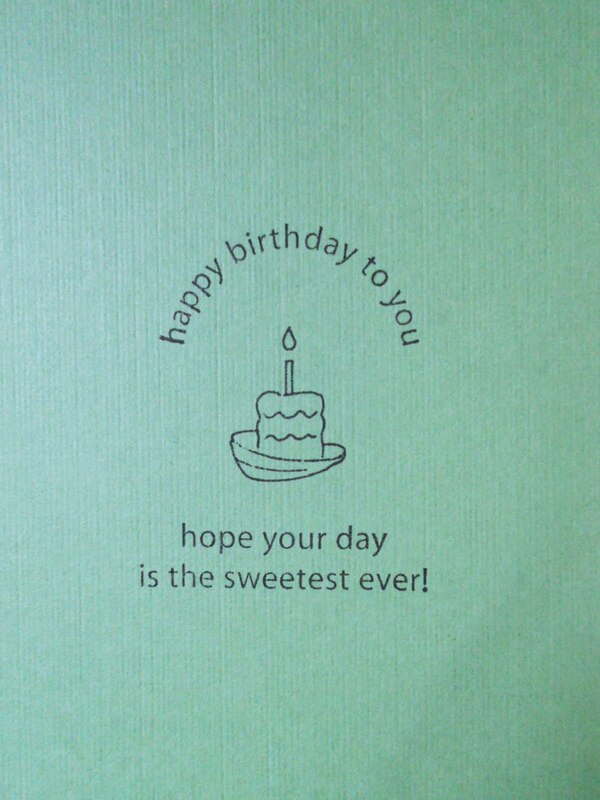 I think I will give this card to my hubby. 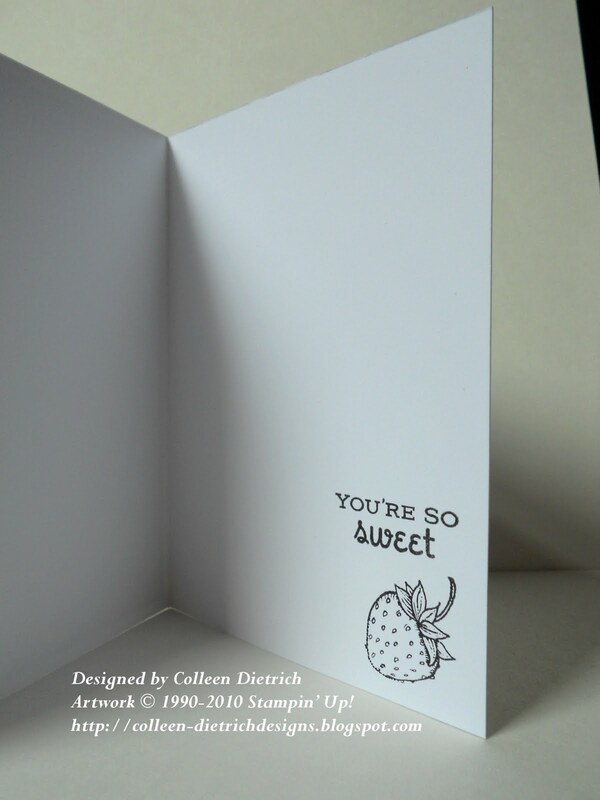 He sure deserves a handmade card from me, just because - no occasion necessary. Thanks for looking at my ice-cream-inspired card! This cute little snowman lost his hat in the winter wind, but he doesn't look too bummed about it. Maybe I could take a cue from his optimistic point of view! When I was coloring his scarf, the red and green stripes reminded me of Freddy Krueger, the villain in the Nightmare On Elm Street movies. Yikes. I didn't mean to do that to the little fellow. You'll be proud of me: I have managed to pull together FOUR challenges for this card. Whoo boy! It takes me a long time to do it, but I can do it. I still need more practice, though. 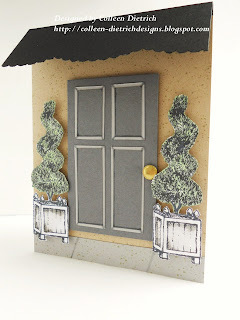 Fab n' Funky Challenges #31 - "It's....Christmas in July"
I could've easily added another challenge on there...an SCS one called "Show Us What You Got", last week's challenge, but I could seriously use that one on almost every card I make! I have waaaaay more supplies than I can use (we all do, right? RIGHT?). 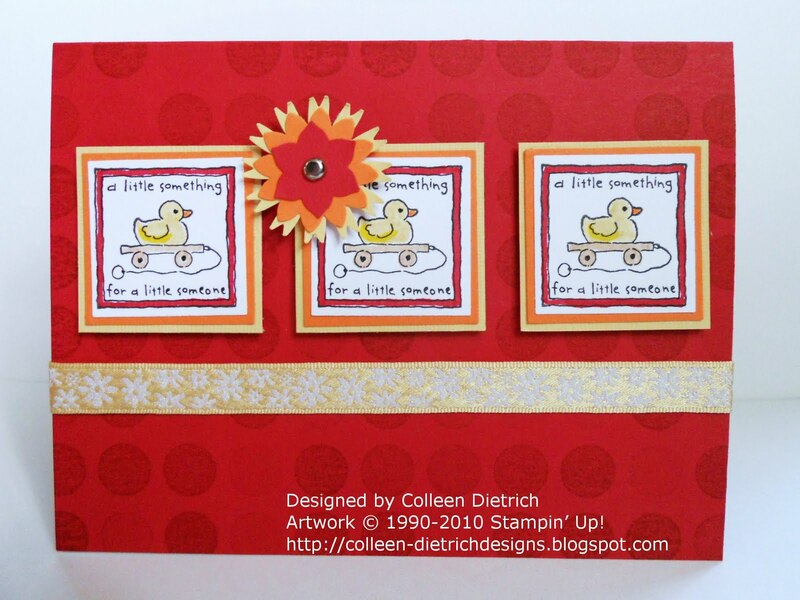 Snow Buddies stamp set by Stampin' Up! and though it's hard to see on the card base, the Polka Dot background stamp by SU! See the sparkly snow and the crazy wind? Well, this card took entirely too long to make today. I want to go swimming with my girls now. When I get a card idea in my mind and then sketch it, it looks like it'll take no time at all. WRONG. It usually takes me the better part of a day (add in some laundry, feeding the kids, petting the cat, general house stuff in between). I MUST try a quicker card next time! Thanks for joining me today! I appreciate it so much. I'm blushing. 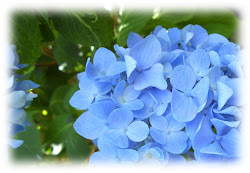 Julie Ranae, owner of the blog, "Julie's Open Window", listed my blog as a "Newer Blog You Must See"! 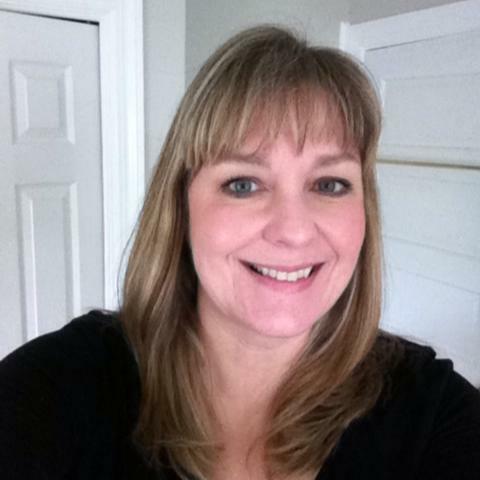 It's on her right sidebar, and my blog is listed along with those of two of my blogging buddies, Emily Keaton and Andrea Ewen. This makes me so happy! Thank you, Julie! For today's card, I feature strawberries once again. 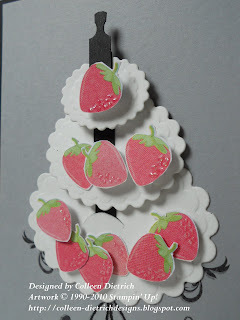 Just a couple of posts ago, I used strawberries too. Well, they are 'sweet'! 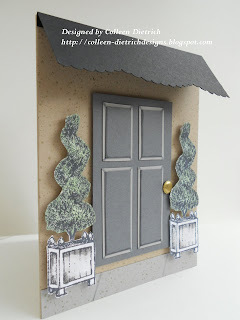 EtsyInspired Challenge #96 - to choose something from the Etsy store Octavia & Brown. 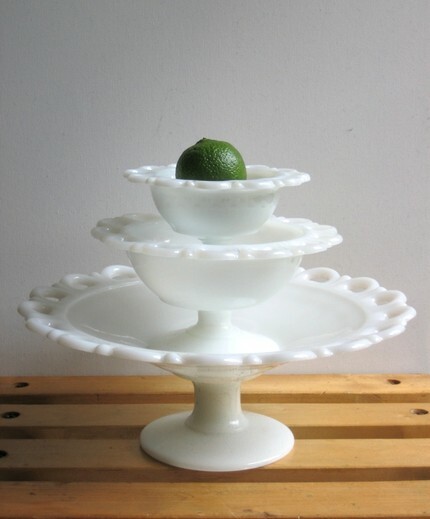 I chose a set of milk glass compotes. 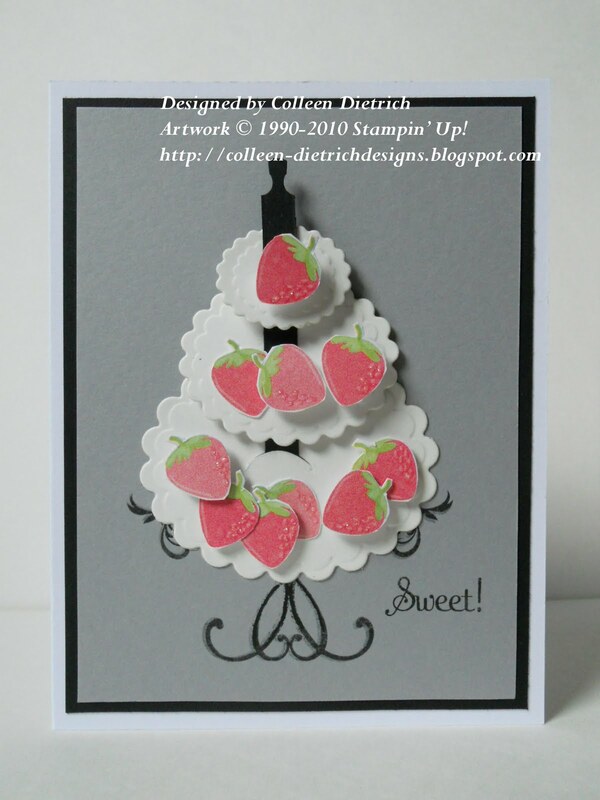 and Double Dutch Challenges DDC#47 - "Movie Madness" - create a card based on a movie. That movie I was referring to? It's called "Wild Strawberries" (1957), directed by Ingmar Bergman. I had never heard of it before, but Googled 'movie title with strawberry in it' and there it was. One way to beat the blues is shopping therapy. 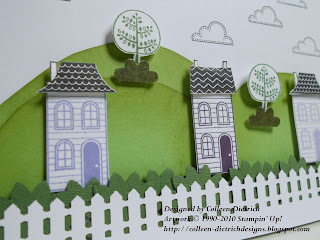 This afternoon my girls and I visited a huge Stampin' Up! sale at my demonstrator's house. 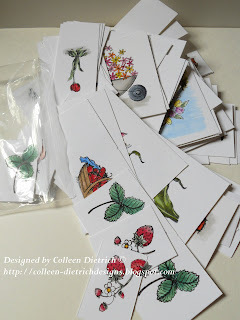 I stocked up on cardstock colors that have been discontinued, and a bunch of other stuff. Not too many stamps, though. I am saving my money for an order from their new catalog. Thanks for joining me today. Hope your day is filled with yummy treats! Wow - two cards in one day, with a refreshing swim in the pool in between! I really feel accomplished! 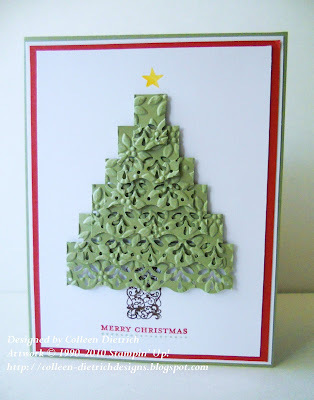 First I gold-embossed my "star"(a snowflake from the Serene Snowflakes set) for the top of the tree. Then a slim strip of Close to Cocoa became the tree trunk. My branches are from the Extra Large Bird Punch (so glad I bought that) on Mellow Moss and ivory cardstock. 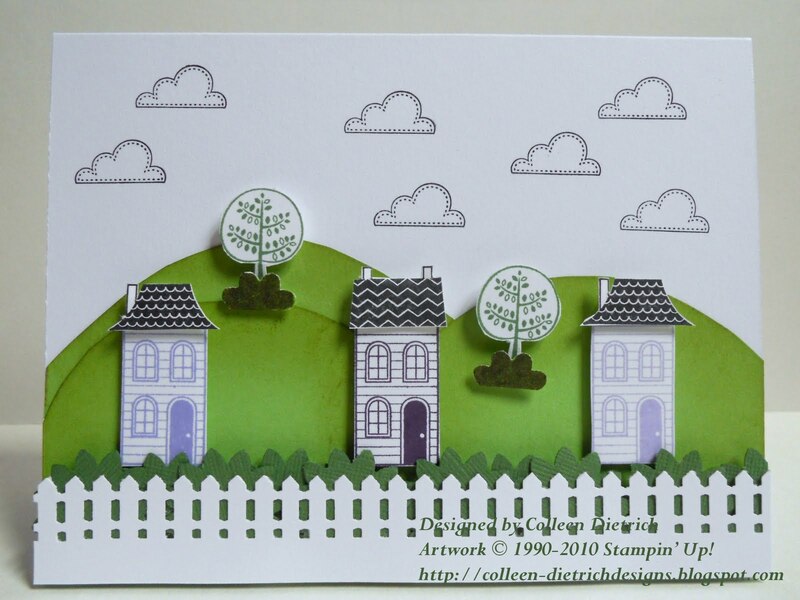 I glued down those branches with a Zig 2-Way Glue Pen. That's it! It took a while to punch and glue, but otherwise it's a pretty uncomplicated card. 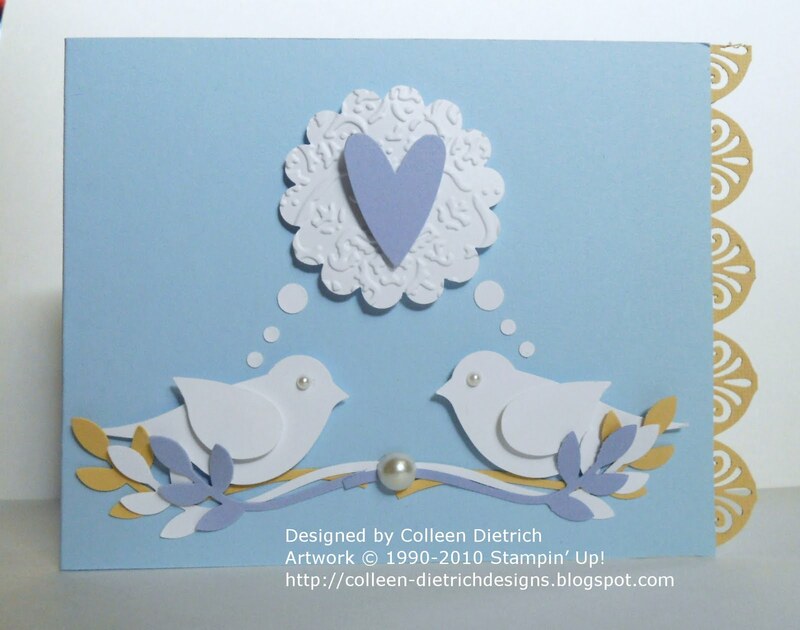 Hope you've been inspired to get that Bird punch out and try something new. I'm playing in some challenges today, three to be exact. This is something I am not used to. I am accustomed to trying one challenge at a time, but I'm trying to up the ante for myself. AND Penny's Paper-Crafty Challenge Blog #33 - to use 7 of anything (the clouds). Do you like my mulch around the trees, seen in the close-up shot? I used one of the flowers from the Boho Blossoms punch and cut it in half. 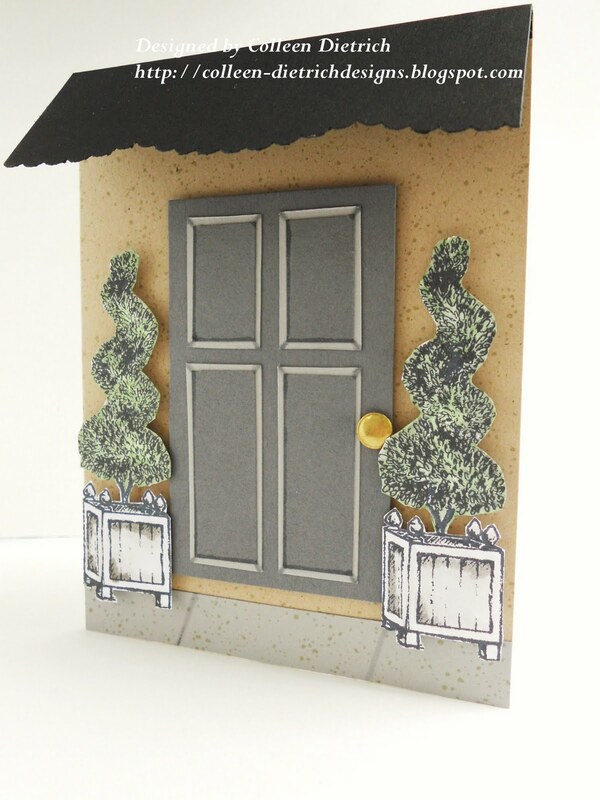 Originally I picked green cardstock for that, then decided it would stand out more in brown. And thus it became mulch! 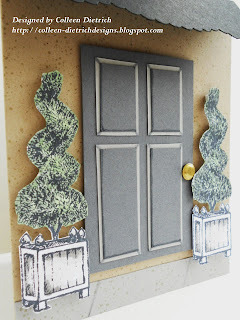 I used another one of the flowers from Boho Blossoms as 'bushes' behind the picket fence punch. My mom is still here visiting from Texas but she goes home tomorrow. Today our plans include hanging out by my pool, and ordering hoagies for lunch (in other regions, these sandwiches are known as 'subs'). My mom ADORES them, but they don't make 'em in Houston like they do in the Philadelphia area! Thanks for visiting with me today. I really appreciate it! 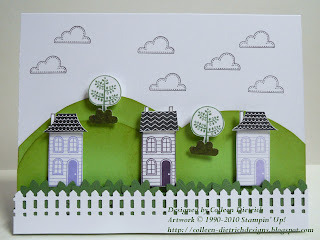 Stamps: Good Neighbors by Stampin' Up! 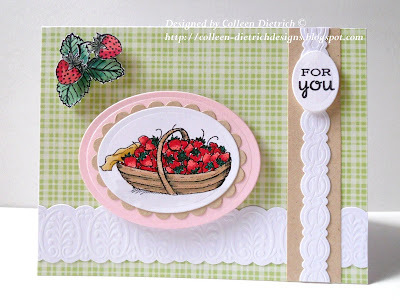 Nothing says 'summer' to me like a basket or bowl of fresh berries. Strawberries that may look red in the market in the winter rarely taste very flavorful. But right now, things are yummy! 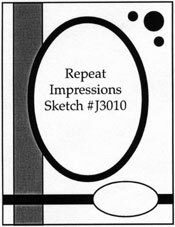 Of course, I have turned this sketch on its side for my card. A close-up of the dry-embossed white stickers. Aren't they elegant? I wish I had bought more last summer! 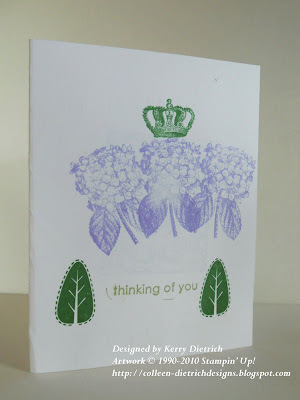 Since my mom is visiting with us this week from Houston, Texas, I haven't had much time for stamping. I swear I felt like I was in withdrawal! Today we took it easy and 'Mom-mom' played with my two girls for a while so I could stamp. She's such an understanding mother! Because I didn't want to take away too much time from being with my mom, I relied upon one of my "tricks" to help me make the strawberry card. 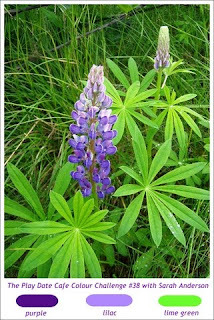 I dug into my bag of colored images and decided upon the berries. Sometimes I just feel like coloring, so I set aside a half hour or so and stamp a bunch of different images on white cardstock scraps. 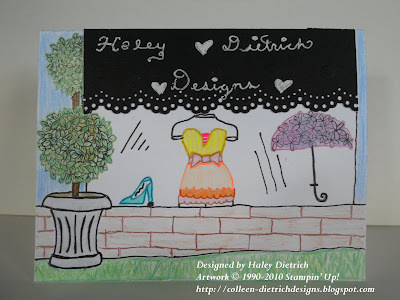 When I get time, I use my Copic markers or Stampin' Up! water-based markers and color away. 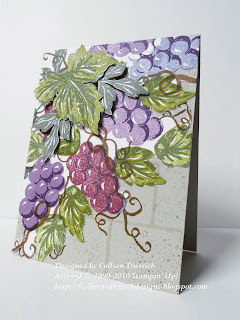 That makes stamping sooooo much easier if you are pressed for time! Thanks for joining me today. I hope I get to stamp again while Mom is here, but we'll just have to see how our schedule goes. Combine first 7 ingredients in a blender. Begin pureeing ingredients at a medium speed while slowly adding the olive oil in a steady stream until oil is incorporated. Toss dressing with salad and serve immediately. 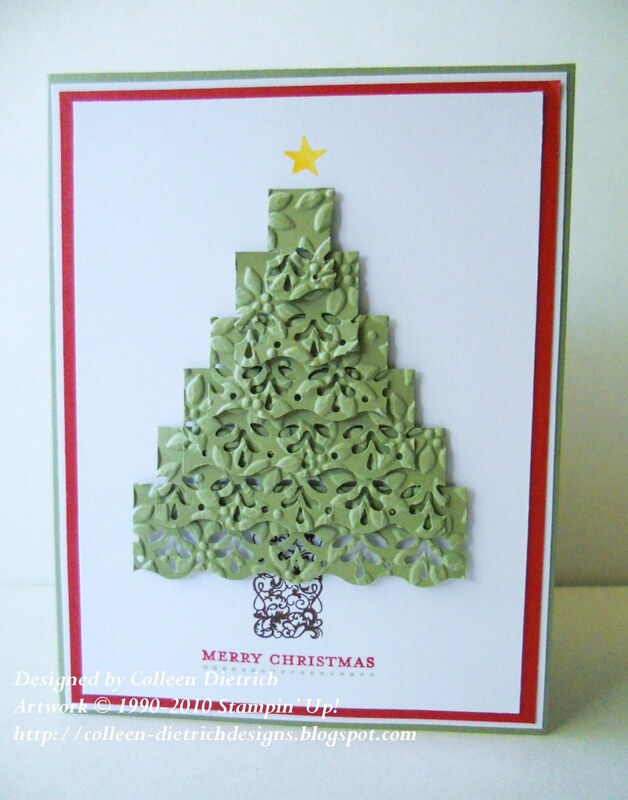 After creating my last card, the punched-Christmas-tree, I knew I wanted to do something similar, but for a wedding or other very special occasion. The timing was perfect for the Splitcoaststampers' challenge, Clean And Simple (CAS) #74, titled, "Celebrations." 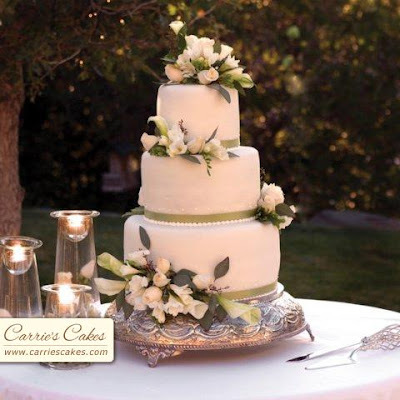 The challenge is to be inspired by any of the cakes by Carrie's Cakes. Even though this card took a little while to make, I think it still looks CAS. I do have something to celebrate: my blog has over 1,000 hits! 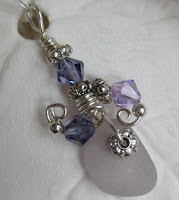 I know there are other blogs with hits in the millions (oh my), but I'm tickled pink that my little ol' blog has 1,000+! 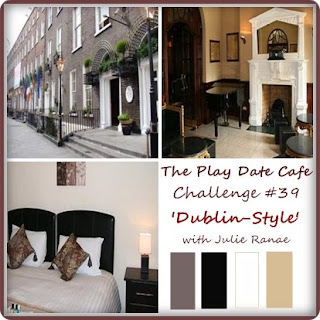 Back to this inspiration challenge. Look at this pretty confection. The cake stand is from Flourishes' Let Them Eat Cake, a great set if you ask me. Other than that, I think it looks pretty simple to dissect. If you have any questions about it though, don't hesitate to ask me! Hope you all had a wonderful weekend. Mine was super-busy and exhausting. I worked Friday night, Saturday night and Sunday at the local grocery store where I cashier part-time. Boy, were we busy. At home, my husband and I are re-doing our dining room, and wallpaper had to be stripped. 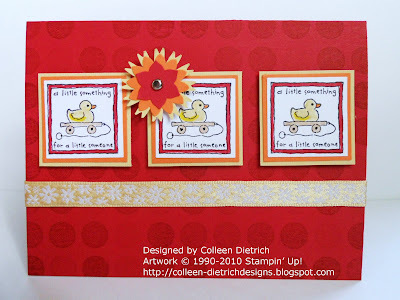 I did not have a moment for stamping, so thank goodness I made this card last week. I did not have time to gold-emboss the star on the top of my tree as I would have liked, so I used a "golden" shade of yellow. Hope that's not cheating! 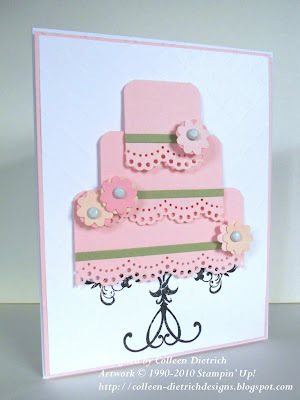 The trunk was stamped in chocolate ink with a cake layer from the Flourishes set, "Let Them Eat Cake". One down for the holiday card stash! Blogger is being goofy. I can't seem to get this post to look "right"! 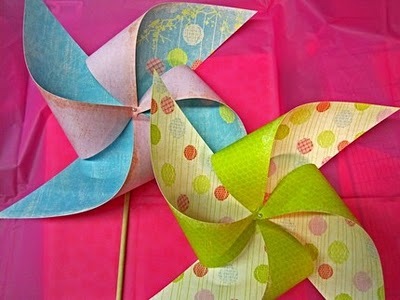 I'm playing in The Shabby Team Room's challenge for the very first time, and challenge #16 is called "Popsicles and Pinwheels". 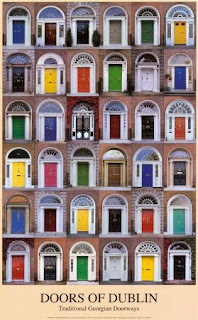 We were to use this inspiration photo here, and use the colors of turquoise, bright green and hot pink. 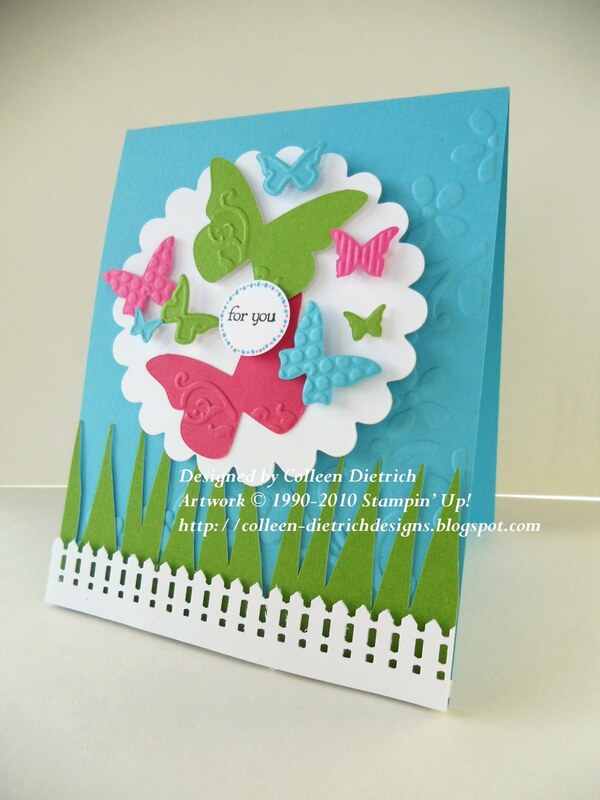 My creative 'mojo' wasn't chugging along as I would have liked, so I re-created a card I had made earlier this year called "Butterfly Garden." I made two different versions of this card. One contains three large butterflies; one contains only two. 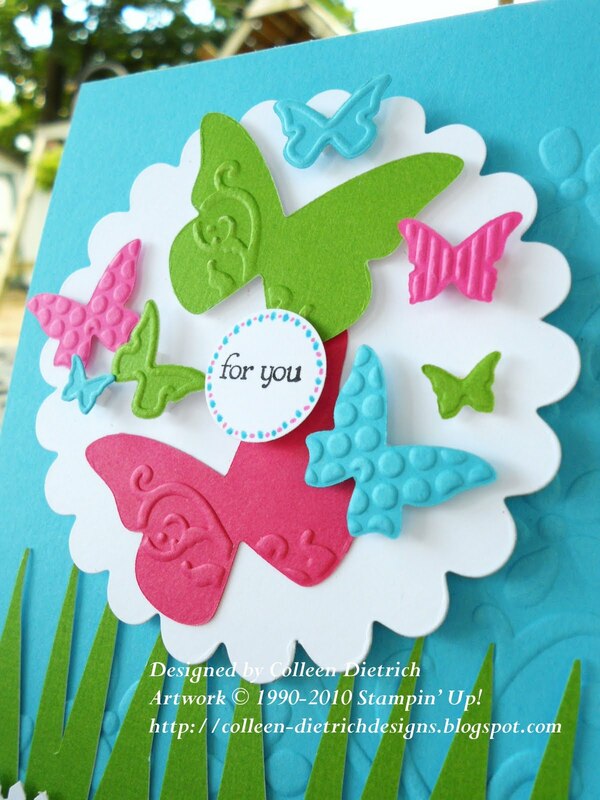 My 12-year old daughter's opinion favors the card with only two large butterflies. "The other one is too busy, Mom," she said. 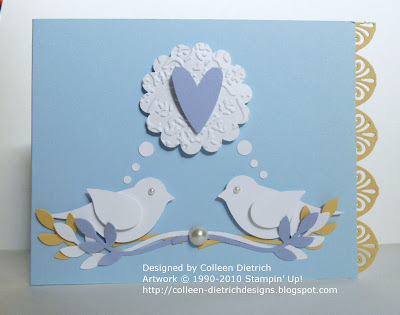 The sentiment spot was created with a 3/4" circle punch and one of the stamps from Teeny Tiny Wishes that officially says, "just for you." I inked up only the last two words with a black SU marker. It seemed too plain as-is, so I added dots around the circle with Pixie Pink and Temptimg Turquoise SU markers.